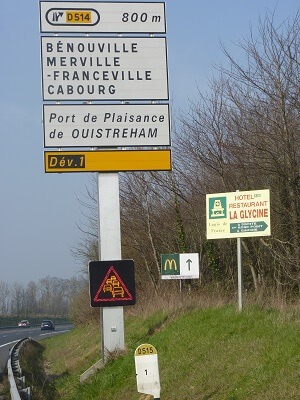 Dynamic LED accentuated signs on exit slip road shoulder. 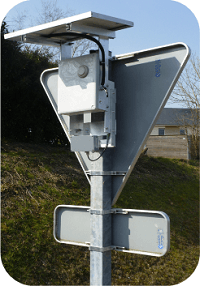 Traffic jam detection radar and signs installed before the exit, managed by GSM. Some site layouts combined with local traffic can create hold ups that snowball into traffic jams. This common problem becomes an issue when it occurs in a no-visibility zone, generating a higher risk of pile-ups. 1. A radar checking the speed and volume of passing vehicles is installed at the point where traffic normally builds up, to detect any traffic jams. 2. Dynamic message signs installed before the exit slip road. In the event of a traffic jam, an illuminated message of “Danger” alternates with a depiction of the AK30 sign. 3. 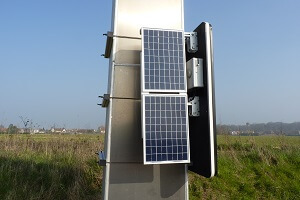 GSM communication between the radar and dynamic message sign takes into account the distance between the signs and sensors, as well as the various risks inherent in the site. The footprint of this detection unit has been minimised so it can be hidden directly behind the AB3 sign located in the traffic jam risk area. The radar is directed towards vehicles close to its location. Its status can be checked simply by sending a test SMS. Thanks to the GSM connection, all radar data and logged operations can be stored on the operator’s hard drive for reference or viewing. Located several hundreds of metres from the radar, well in advance of the traffic jam danger zone, this sign activates only during traffic jam risk periods. When a traffic jam is detected by the radar, the sign is activated by GSM and displays an alternating illuminated sign = AK30 then “Danger”. The alternation frequency can be changed. The illuminated sign turns off automatically once the radar no longer detects a traffic jam. This sign is autonomous and automatically powered by its own 24V DC solar unit. A test can be done at any time by the contractor.